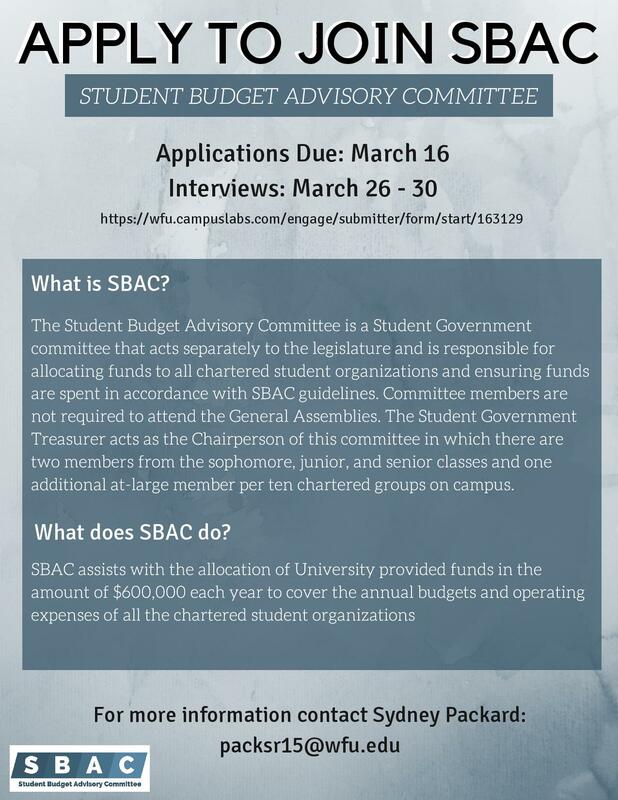 The time for Student Government Elections, the representative governing body for undergraduate Wake Forest University students, and the Student Budget Advisory Committee (SBAC) application process is fast approaching. Below are important dates for both processes as well as the SBAC flyer and Student Government Elections Packet. Student Government Elections are a sanctified process for the student body of Wake Forest University, and it is vital that they remain so. It is the goal of the Elections Committee that the following guidelines ensure that all elections are fair and equitable, independent of the candidate or office in question. The campaign environment, enforcement of all campaign rules, and treatment of candidates in informing, investigating, and punishing campaign violations is upheld by the Elections Committee made up of: SG’s faculty advisory, the SG Executive Branch, the Student Trustee, the Judicial Co-Chairs, and the Judiciary Committee Co-Chairs.